I can’t remember when I first heard about Karl Lagerfeld, it was years ago and I was immediately intruiged with the man behind the seams at Chanel. I would scour the internet for any information, pictures, interviews, and videos of him, but never came up with much. I knew what he looked like, what he did for a living and I knew who he was most likely to arrive arm in arm with at the Costume Institute Gala or who he would most likely seat front and center at one of his shows, but I was more interested in the man himself. I wanted to see him on an average day (pretty sure it doesn’t exist), I wanted to know the man behind the dark shades and underneath the black and white suits and black leather gloves. I was beyond thrilled when I discovered there was a documentary out titled “Lagerfeld Confidential”. I could NOT believe that Karl agreed to let cameras into his private world of glamour, luxury, and excess. Now take that excitement and multiply it by 32 and that’s how excited I was when the news hit that Anna Wintour was doing the same thing. Anna. 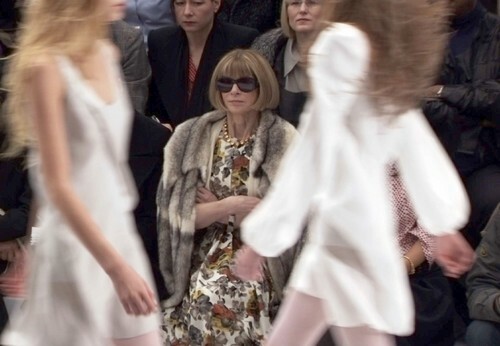 Wintour. While I scoured for Karl, I more or less stalked for Anna. I was obsessed with knowing the woman who was perched upon the throne of Vogue Magazine. The woman who had a best selling novel turned film written about her and her ice cold demeanor, the woman who literally held the keys to the gates of fashion in her cold, skinny, hands. When I heard about “September Issue”, I couldn’t believe that I was going to be invited (for 90 minutes) into the world of Ms. Wintour and Vogue. I couldn’t wait to see the ice queen interact with her staff and everyone in her world and to see inside her home and the offices of Vogue. The film was T.D.F. (to die for)…seri T.D.F. And the icing on the cake? Well, I did not think that for ONE second Anna would be letting her walls down, but she COMPLETELY did. I won’t ruin it for those who have not seen, but I strongly encourage anyone who has any curiosity or interest in the world of fashion, glamour, and beauty to go see “September Issue”. Ms. Wintour knocks em’ dead in knee length, floral, dresses and her signature oversized black Chanel’s. You go girl! I totally watched the Lagerfeld Confidential on the sundance channel one night. The entire movie was in French and made in about 2007 but I didn't care. It was amazing to see him behind the scenes. I am also so excited to see “september issue”. you are right girl it is going to be T.D.F.! I am jealous you already saw it!! !